Once again, my friends at work and I are running the CiSRA Puzzle Competition, now in its sixth year. The competition's Puzzle Week this year begins on Monday 1 October, 2012. We were inspired to run this competition by the Melbourne University Mathematics Society, who have held a similar competition since 2004. A group of us at work enjoyed participating in that and solving the puzzles, and took it a step further by creating puzzles for the others in our group to solve. The next step was to publish our puzzles, and we took the initiative of proposing a public puzzle competition to our managers, suggesting we could offer prizes to Australian students and use it as a way of raising the company's profile as an employer of bright graduates. Our bosses agreed to finance prizes and in 2007 our first competition was born. Since then, we've grown to be quite successful and an anticipated event on the international puzzle solvers' calendar. This is on the strength of the puzzles we provide. If our puzzles had not come up to a certain standard of quality, our competition would have faded away, rather than grown in participants each year. So it's very important for us to make the best puzzles we can. So... what makes a good puzzle? Firstly, the sort of puzzles we're talking about are not the standard sort of puzzles that most people do, like the crosswords or sudokus that you find in newspapers. With those sorts of puzzles, you know exactly what you're supposed to do, because they're so common in our culture that almost everyone has been taught how to do them at some point. You know exactly what to do - the tricky part is figuring out the provided clues to complete the puzzle. 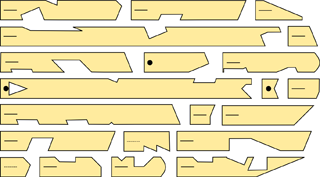 The puzzles we make, and that feature in several other international puzzles competitions on the Web, are all unique, novel, and generally come without instructions. The first part of the puzzle is usually figuring out what you're supposed to do with it! Once you've made that first insight, you can start work on the puzzle. There'll be a step in which you take some of the information in the puzzle—be it words, pictures, graphics, colours, or maybe something else—and process it somehow. This step can be extremely varied, and may include things such as combining objects in groups, identifying quotations, extracting sub-pieces of things, cutting stuff out and rearranging it, drawing lines on things, shuffling words or letters, or sorting things into groups. This step often leads to a new set of information, which somehow encodes the final answer. As an example of this process, consider a standard word search puzzle, of the type you've probably seen many times. You're presented with a grid of letters and you need to find a provided set of words within the grid, by following letters in straight lines, left, right, up, down, or diagonally. Once all the words are found, the left over letters that haven't been "used up" by any of the words will spell out a word or phrase that is the final answer to the puzzle. This is all fairly standard so far. We might tweak a word search by not providing any list of words to find. Or providing a list of words that aren't in the grid and that need to be used in some other way, or by providing a grid with symbols instead of letters. This sort of thing forms one class of puzzle that we might create: one which looks a bit like a familiar sort of puzzle, but with a twist. This is one of the elements that can make a good puzzle - an unfamiliar twist on a known theme. 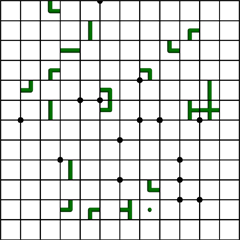 By providing something that looks familiar, the creator can leverage the built-in knowledge of puzzle solvers. Provide a grid that looks like a crossword, and the solver will quickly figure out that it needs to be filled with words. With the old must come something new. Something creative. 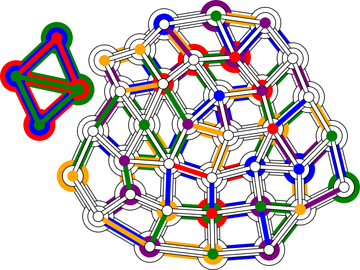 Something that will make a seasoned puzzle solver sit up and say, "Wow, this is cool. I wish I'd thought of making a puzzle like this." One way to do that is to play with expectations. Provide a crossword grid, but the secret to solving the puzzle is actually to fill it with colours. Or to rearrange the black and white squares. 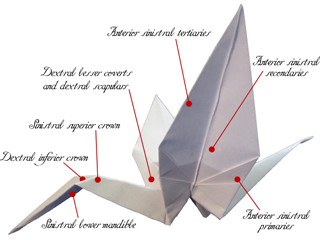 Or to cut it out and fold it into origami. Another approach to novelty is to provide something completely unlike anything the solver has seen before. An extract from Hamlet with character names replaced by pictures of food. An audio file of a song. Something that looks like a work of abstract art. How does one go about solving such a puzzle? This is where the puzzle creator's art comes in. You need to provide enough clues to allow the solver to start working on the puzzle. The clues can be relatively obvious, or fiendishly cryptic, but they should be fair. This means two things. Firstly, that once the solver figures out what to do, it becomes compelling to perform the task. Secondly, that if the solver never figures it out, then once the solution is revealed and the clues explained, the solver will slap themselves on the head and think, "Of course! It seems so obvious now!" Compellingness is very important. If you expect the solver to do a complicated and difficult step in the puzzle—for example, solving a virtual Rubik's Cube with numbers on its faces that make up sudoku grids—then you have to give them good reason to believe that all that hard work will be worthwhile. Otherwise they won't feel motivated. You don't eagerly invest an hour into some difficult puzzle step unless you think it's the right thing to do. You want to make your puzzle so that the correct thing to do is, if not necessarily the most compelling thing to try to do, it is at least in the top two or three at first appearances, and that once you start doing it, it becomes more compelling. The solver should get the sense that they are "doing the right thing". Related to this is to avoid red herrings. Red herrings are information or procedures that look compelling and like they should lead towards the solution of the puzzle, but really give you nothing. Often, solvers will latch on to a red herring and investigate it thoroughly, tracing the dead-end trail right to the end, and then—not wanting to let it go—they will ponder over it for some time before eventually (hopefully) realising it's not going anywhere and returning to look at other aspects of the puzzle. This is simply a waste of time and effort for the solvers, and leaves a bad taste in the mouth when they realise what's happened, either when they solve the puzzle or when the solution is revealed. For this reason it's important to avoid unintentional red herrings in your puzzle. The only way to do this is to playtest the puzzle on people who were not involved in creating the puzzle. They can confirm that the puzzle is solvable, and spot any red herrings that distract them from what they're really supposed to be doing to solve it. The playtest procedure is absolutely vital, because the puzzle creator knows how the puzzle is supposed to work, so cannot know how easy or difficult the puzzle will be to solvers. Playtesters can also provide feedback on anything in the puzzle that is confusing, ambiguous, or outright wrong, and give suggestions on improving the puzzle. The other important thing about red herrings is not to introduce them deliberately either. Red herrings are a potential way to add complexity and difficulty to a puzzle, and it can be tempting to add some misdirection on purpose. But difficulty is much better achieved by providing either a difficult working step or requiring an unusual insight into the puzzle mechanics, than by setting up a dead end trail that looks like something the solver should try. In exactly the same way that an unintentional red herring can frustrate solvers, a deliberate one simply wastes their time and energy, leading to frustration and a poor reaction to the puzzle. Having spent three paragraphs warning of the dangers of red herrings, they can have their uses in some puzzle designs. The thing is, you have to make them very smelly. A smelly red herring is one that smells fishy when the solver starts to look at it. They should rapidly get the sense that this is a red herring, because it very quickly leads into a spot where there's obviously no more progress to be made, or it gets so messy that its compellingness drops through the floor. The solver should drop it like the stinking pile of herring-flesh that it is, and start to look for something more productive to do. The opposite is the clean red herring - the one that smells fresh and delightful, and leads the solver on a merry chase for hours. That has to be avoided at all costs. Even a truly smelly red herring is a sign that your puzzle may not be as elegant as you'd like, and you should think about redesigning it, but it is a potential tool. I've now mentioned the idea of insight. Many puzzles begin by presenting the solver with something they've never seen before, and requiring them to figure out what to do. In some cases it's fairly obvious, but often the puzzle requires an initial insight to figure out what needs to be done. We call this step the "intuitive leap", and use this term a lot in our puzzle brainstorming, playtesting, and solving sessions. The "intuitive" part is important, because this insight has to be made cold, with no prior information about the puzzle. And it needs to be something that a solver can spot, despite never having seen the puzzle before. Thus it relies on the puzzle solver's intuition. This is a honed intuition, in the context of someone who likes solving puzzles, so the insight required can be tricky or somewhat non-obvious, but it should always be possible to make this leap. Some puzzles fail at this first hurdle, by presenting information that very few reasonable solvers can even begin to figure out what to do with. Some puzzles are pretty much entirely intuitive leap. They present something that poses the problem of figuring out what to do, but once you figure that out the processing step is straightforward and leads quickly and directly to the answer. To make up for the relative ease of the processing step, puzzle creators are tempted to make the intuitive leap difficult and highly non-obvious. This sort of puzzle can be somewhat annoying, particularly in a timed puzzle contest, because people naturally make intuitive leaps at different speeds. Some will spot the leap quickly and immediately solve the puzzle, while others might stew over the puzzle for hours, not making any progress at all until the spot the leap and solve it. This leaves them thinking they could have solved the puzzle hours ago too, if only they'd spotted that ridiculous leap sooner! A more satisfying puzzle structure is to have some moderately time-consuming or difficult working step after a lower intuitive leap barrier. This means most solvers will get into the working step and spend most of their time on the puzzle actually doing stuff than racking their brains figuring out how to even get started. Doing stuff and making progress is much more mentally satisfying than wondering what you're supposed to be doing. 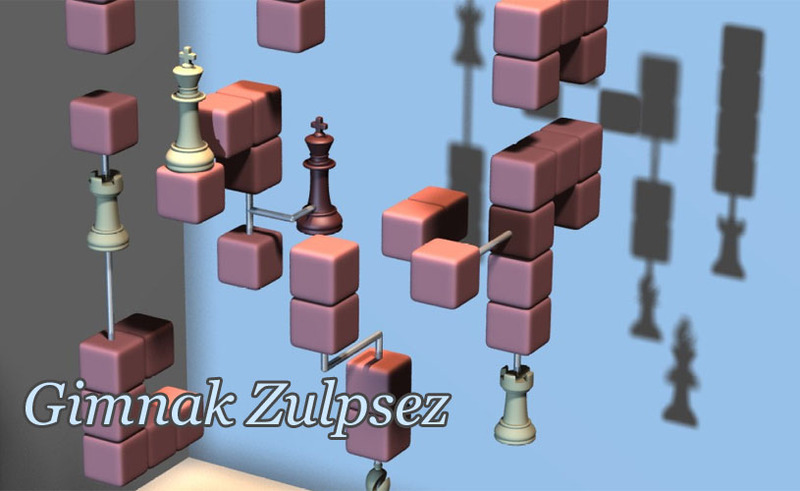 Progress is another important feature of puzzle solving, and hence puzzle design. If a solver can't make any progress, they quickly get frustrated. As well as getting stuff done, it's important to know that you're getting the right stuff done. So a good puzzle will provide positive feedback: little hints and confirmations that the solver is doing the right thing. For example, if you're rearranging a bunch of coloured blocks, it's nice to have the blocks make familiar shapes as you go, and then when you're finished for the letters on the blocks to suddenly spell out words. This is a strong confirmation that you really were supposed to rearrange the blocks, and that the way you've done it is probably correct. If you rearrange the blocks and don't find any familiar shapes or words, then you could be left wondering if that's what you were meant to do. At that point, solvers might abandon that line of action and look for something else to do, which is terrible if they were on the right track! Progress is important to establishing compellingness. Another concept that is important to solving and creating puzzles is consuming information. A puzzle provides a certain amount of information, for example a big list of words. Working through the steps of the puzzle usually reduces the amount of information, until finally you've distilled it down to the solution. At this point, all of the information presented in the puzzle should have been "used up" somewhere along the way. If you start with fifty words, and getting the answer to the puzzle uses only forty of them, then ten of the words have played no part whatsoever in the solving process - they haven't been used up. This makes the solver feel like they've missed something, and can make them uncertain about their solution. The extra unused information can easily become a red herring. It's common for puzzles to use part of their initial information in a first step, and then use the remainder of the information in subsequent steps. This is fine, and the fact that there's leftover data after the first step implies that the rest of it should be used somewhere else in the solving process. As a solver, you're always trying to make sense of all the information given to you - it should be there for a reason. So if there's a bit of information you haven't used yet, it's really a clue about what to do next. At least it should be - this is why using all of the information is important in designing the puzzle. 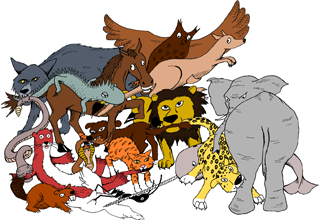 This principle means that one particular class of puzzle is very difficult to design well: photo puzzles. A photo puzzle will present a series of photos, and you need to use the information contained within the photos to figure out what to do. The problem is, a picture is worth a thousand words. A typical photo contains lots of information. For example, a photo of a street scene with a person pointing at an advertising sign. Are they pointing at a word on the sign - do you need to use that word? Are they pointing at a picture on the sign? Is the sign unimportant and what matters is just the direction they're pointing? Do you need to identify what city they're in from the buildings in the background? Or is it the colour of the car parked next to them that's important? Or what the other person standing behind them is doing? Photos often lead to information overload in a puzzle, making solvers unsure what information in the photos is actually important and what is irrelevant. This is red herring territory. You can use photos, but you need to be very careful to avoid distracting information in them. There should be no extraneous information in the puzzle, but you can go the other way and reuse some of the information. If a list of song lyric snippets boils down to a particular band, then that might not be the end of the puzzle. 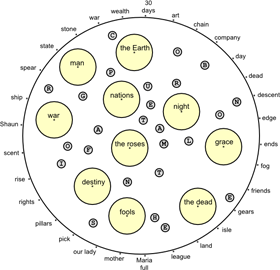 Closer inspection may reveal that all of the lyric snippets are also quotations from Shakespeare plays, and the intersection of the band name with Shakespeare could lead to the final answer. Using information in two different ways like this is difficult to create, but can increase the feel of elegance in a puzzle, which makes it more satisfying to solve. Related to reuse is recursion. Many puzzles use a two-step solving process. You apply some procedure to the information presented, which reduces it to a smaller set of new information. Sometimes this is a single word or phrase that is the solution to the puzzle, but often it is an intermediate step that you need to do something else with in order to derive the final answer. If the "something else" is actually the same sort of procedure as the first step, then that's recursion. Even if the amount of information derived at the start of the second step is too small to have figured out what to do with it if presented to a solver cold, the presence of the first step can now provide the vital clue to what needs to be done next. Sometimes recursion is applying exactly the same step again. For a simplistic example of recursion, given a big list of words, if you read the first letter of each word down the list, it might spell out another bunch of words. Start with fifty words, and you might end up with seven or so. If you then have to read the first letters of those seven words, that could spell out the solution word. That's straightforward recursion. Then there's recursion with a twist. Maybe at the second step you need to read the last letters of each word. Or the third letter of each word. Or read going up the list instead of down. These things might not seem very obvious if given just the list of seven words at the start, but once you've done the first step your brain is primed to look for similar ways to proceed. Making the recursive step a twist on the first step keeps things interesting, but still satisfying. Finally, a puzzle often has a theme. Some puzzles don't - a standard newspaper crossword for example usually has no theme. But you can theme a crossword by making all (or many) of the words in the grid related to some specific topic - say, sports. If you fill in the grid with a bunch of sport-related words, then the next step of the puzzle might extract a bunch of letters, which anagram to give you a sport-related word, which would be the final answer. Ideally the theme of the puzzle should be present at all stages of the working out, from the intuitive leap, to the working steps, to the final answer. This can be difficult, so it's not always achievable in a puzzle design, but it adds to the sense of elegance and can be a good confirming step that improves compellingness. Puzzles don't need themes, but they can be very nice additions. I hope this may inspire you to check out these sorts of competitions, and I and my friends hope you enjoy our puzzles! P.S. If you're intrigued by any of the puzzles shown here, you can grab the full puzzles from the links or by clicking the images. The title image is actually four separate puzzles: Martial Law, Chebble, Blockhead, and The Missing Monkey. These are all puzzles from our old competitions: All of the old puzzles and the solutions are available by browsing the site archive. Last Modified: Sunday, 9 September 2012; 03:48:49 PST.